The Table of Contents on the navigation menu. 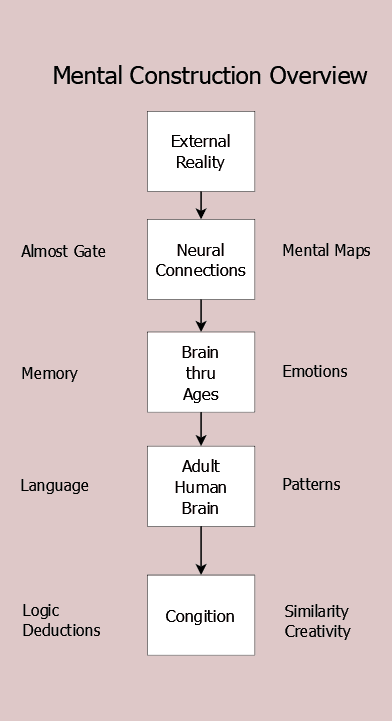 This leads to development of cognitive features from basic neural properties. Posts (default home page) more casually describe the features and implications of the Almost Gate, Concept Elevation, incremental learning, and the essential process of association. Most ideas are depicted in figures as well as text. This is a deliberate effort to make patterns as important as logical linkage, a key concept in Mental Construction. These implications are sometimes made explicit in this website. Others are clear consequences, but it was too distracting to mention during the development of the overall argument. We think deductively with words, but we also think inductively with patterns. These two processes usually go on simultaneously, although one method often becomes the preferred method of thought at the conscious level. Our current educational and cultural preference and reliance on verbal (logical) discussion and training biases us to rely on deduction. Individuality. Idiosyncratic genetic and biological factors. Unique individualistic experiences. The Almost Gate and its looseness allow for creativity, but also produce errors. Philosophical oppositions, like subjectivity-objectivity and universals-experiential, are productively understood with the Almost Gate filtering our experience. To see the ideas developed in logic order, the Table of Contents is the best entry. Click on the large Mental Construction at the top of this page to see the latest posts.